Enjoy the timeless counter top you've always wanted! 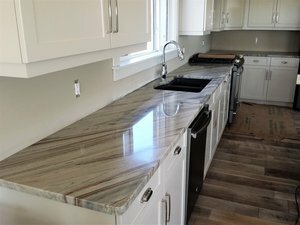 Salvador Stone & Granite, a family run business specializing in countertop sales, fabrication, and maintenance, was founded in Edmonton, Alberta, Canada. We pride ourselves in our ability to deliver amazing craftsmanship so that you can enjoy the timeless countertop you've always wanted! From your kitchen to your bathrooms, and any other space in between, we have stones available to give your home that certain touch and personality you desire. We offer various products: granite (standard, premium, exotic and semi-precious), quartz, and custom artwork. And as an added cherry on top--or bottom--you can also choose from our selection of sinks to match your new stone countertop. We provide free estimates and will be with you every step of the way, from start to finish. We'll also be there with you even beyond the finished product! If you're having issues with your stone, whether it be stains, cracks, or chips, Salvador Stone & Granite will help you through it! Contact us if you have any questions or to book an estimate. Shown below are examples of our completed projects. Want to see more of our finished work? Take a peek inside our gallery! Want to learn how to keep your countertops in mint condition? Check out our blog!